One of the hottest, most important ideas in decades is the concept now known as Industry 4.0. This is not a new concept, but is a continuation of the advancement of technology to support product manufacturing. It demarcates one of those times when technology and society is beginning to intersect to change the way we live and produce. The last big confluence was the late 1970s and early 1980s when the Information Age, also known as Industry 3.0, was born. 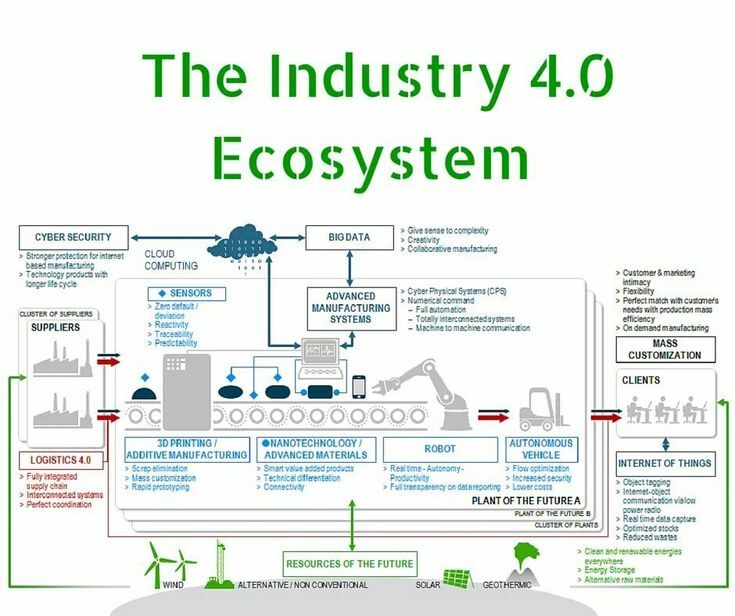 Industry 4.0 is generally considered to be the aggregation of robotics, AI (artificial intelligence), Cloud computing, autonomous vehicles, machine to machine communications and control. It is the realization of “lights-out” manufacturing and achieves what many people consider to be the “Jetsons Age” with reference to the 1960s Hanna-Barbera cartoon series. Futura Automation can help bring together all the pieces of Industry 4.0 so that our clients can begin reaping the benefits of this evolutionary and revolutionary concept. Futura Automation offers robots, end of arm tooling, networking solutions, software and system integration partnerships to bring together the components. This graphic very well represents the confluence of all relevant technologies. Weintek cMT solutions provide access to all the required machine data to implement Industry 4.0. What is still required is a way to manage and process the data and provide reports or notifications to Personal Digital Assistants (PDAs) or an office desktop computer when a machine requires maintenance, either on a planned, a predictive, or emergency basis. The above diagram references this set of solutions as “Logistics 4.0”. eRPortal Software provides high performance, web-enabled, Enterprise Asset Management, Maintenance Management, and Materials Tracking software solutions for managing strategic assets and operations. eRPortal deploys technology that maximizes operations efficiency and asset utilization levels. It is architected for flexibility, interoperability, and user interface adaptability providing Preventive or even Predictive Maintenance (with the addition of operator-derived data based algorithms), Work Order management, Asset inventory and maintenance history, Emergency Breakdown maintenance procedures and repair documentation and Management Reports. Industry 4.0 requires smart and flexible machinery to fully realize its potential. Machines can be in a category of “fixed automation” or robotic automation, which is inherently more flexible and powerful. Toshiba Machine Robotics is a manufacturer of a wide range of robot components including Cartesian, SCARA and articulated (6-axis) robots with reach from 180mm to 1800mm and is representative of the type of robots that will fulfill Industry 4.0. Toshiba Machine also builds CNC metal fabrication machines, die-casting and plastic injection molding machines which are additional components to Industry 4.0 when equipped with the required intelligence and handling automation that comes from machine tending robots. Balance of work cell solutions include components such as from Sicron for robot or hard automation welded machine bases and fabricated enclosures; Macron Dynamics for linear actuators, gantry robots and 7th axis rails for robots; Flexomation for fixed part feeding and Carter Enteprises for custom part feeder bowls and conveyors; RMI Laser for laser marking or part etching solutions; Quanergy, Technology Brewing and OceanX for 3D integrated precision robot vision; Robot System Products for robot tool changers; Visumatic for robot screw-driving and fastening systems; Air Turbine Tools for robot grinding and finishing tools; Joulin for foam grippers and Rohm Products for mechanical grippers; Robovent for gas and particulate ventilation; Vanguard Automation for wrapping and strapping solutions. There are other categories of balance of cell components that are required for complete Industry 4.0 solutions such as machine safety systems, electro-mechanical drives such as from Applied Motion Products and Zero-Max couplings and sensors to detect position or part condition. Futura Automation also partners with system integration and field service partners like Delta Technology, Technology Brewing, Oregon Electric Service and Spiroflow, that will design, fabricate, install and commission machine cells that combine the various components of an Industry 4.0 compliant solution and help customers install and integrate the required software into company business systems so that machines will communicate directly with machines and order their own maintenance and parts. Industry 4.0 is the realization of a centuries-old dream that machines will work for people and make life easier, security and comfort more accessible.